Callum Roberts celebrates his goal at Blackburn. When Sean Longstaff saw his long-range effort deflected past Blackburn Rovers keeper David Raya, it ended a run of 1,914 days since the last time a homegrown academy graduate had grabbed his first goal for Newcastle United. You have to rewind to October 2013 for the last time a Geordie had come through the system and registered on the scoresheet for the first time, when Paul Dummett stepped off the bench against Liverpool to side-foot home Yohan Cabaye’s free-kick in front of the Gallowgate End. There have been few academy successes since. Rolando Aarons briefly flickered, and grabbed a couple of goals, but wasn’t from the region while Adam Armstrong – who ironically was also on target at Ewood Park on Tuesday night – failed to register for his hometown club in 17 appearances. Longstaff’s maiden strike in black and white ended Dummett’s claim, 234 competitive first-team matches after the left-back broke his duck. Thankfully, the wait for the next goal from a United youngster was short-lived. Just 21 minutes later, Callum Roberts also got his name on the scoresheet, four years after making his only other first-team appearance in an FA Cup defeat at Leicester City as a 17-year-old. It was a landmark night for United’s academy and for Under-23s coach Ben Dawson. Longstaff and Roberts have been mainstays of Dawson’s side since the coach stepped into the breach left by Peter Beardsley’s continued absence from the club. Aided by the likes of Steve Harper, Simon Tweddle, Kevin Richardson and Carl Nelson, Dawson has overseen a remarkable change in fortunes for the club’s youngsters. Progress has been notable, results have improved, attitudes have changed. There is a raft of the current crop of United youngsters that are starting to show real signs of progress. Danish striker Elias Sorensen has hit the headlines; Bury are keen on Matty Longstaff after his rapid progression; U23s captain Owen Bailey is in line for a loan switch similar to Liam Gibson who joined Accrington Stanley this month. Dawson is a cool, calm figurehead for the United youngsters and along with ex-Toon keeper Harper and the other coaches, is hoping to keep developing the talent. After Monday night’s 4-2 win over their West Brom counterparts, midfielder Matty Longstaff said: “You develop a lot working with Ben, Steve Harper and all of the coaches at the academy. “Especially this year, going up to this level, you can see the difference in the pace of the game. “I’m working alongside Ben, getting little tweaks like getting in the right positions defensively and trying to do a little bit more on the ball. 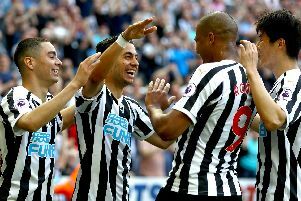 Signs are flickering that there could finally be a fresh bunch ready to follow in some illustrious footsetps at St James Park.